The survey packet you have received contains one header sheet and enough Student Instructional Rating Forms for the total enrollment of your in each section of the course you are teaching, as of the second week of the term. Please be aware of the deadlines for the receipt of completed packets by the CTAAR for scanning and processing, and contact us if you need more survey forms (732-932-7466, info@brokenmail.rutgers.edu please replace brokenmail with ctaar.rutgers.edu ). Photocopied forms will not scan correctly. We suggest that you conduct the survey sometime during the last two weeks of classes. If at all possible, do not conduct the survey on the last day of class. Please complete the header sheet provided in the packet. Please write the school code, department code, course number and section number for you course, the course title, your name, and the appropriate date on the board, or project these data on a screen, for the convenience of your students. 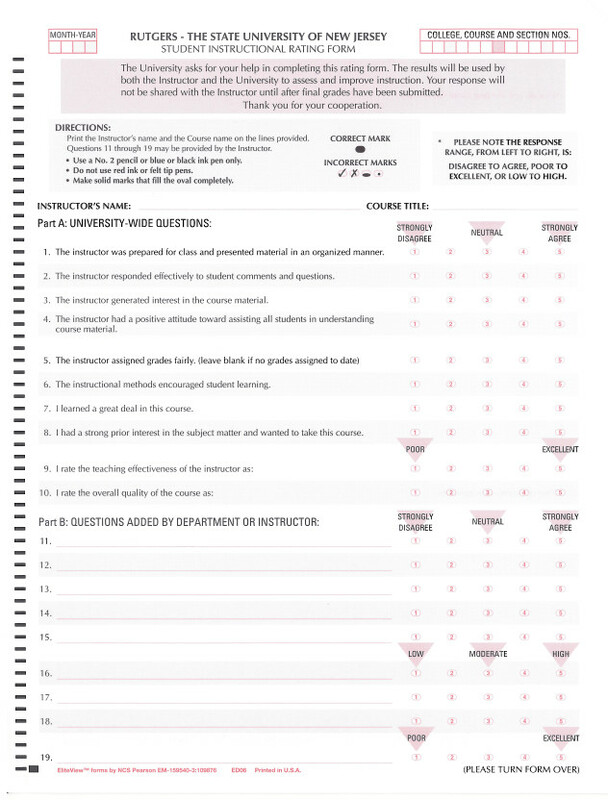 Please inform your students that there are three parts to the Student Instructional Rating Form, Parts A, B, and C.
Part A: Part A on the front side of the Student Instructional Rating Form consists of ten questions that students should answer by marking the appropriate response box next to the questions. Please ask students to fill the response box completely; check marks, x's and circled responses cannot be read by the scanner. Any incomplete erasures or double-responses will not be read accurately by the scanner. Students must use a dark pencil, a black pen or a dark blue pen. Red ink or other color ink cannot be read by the scanner and will not be counted. 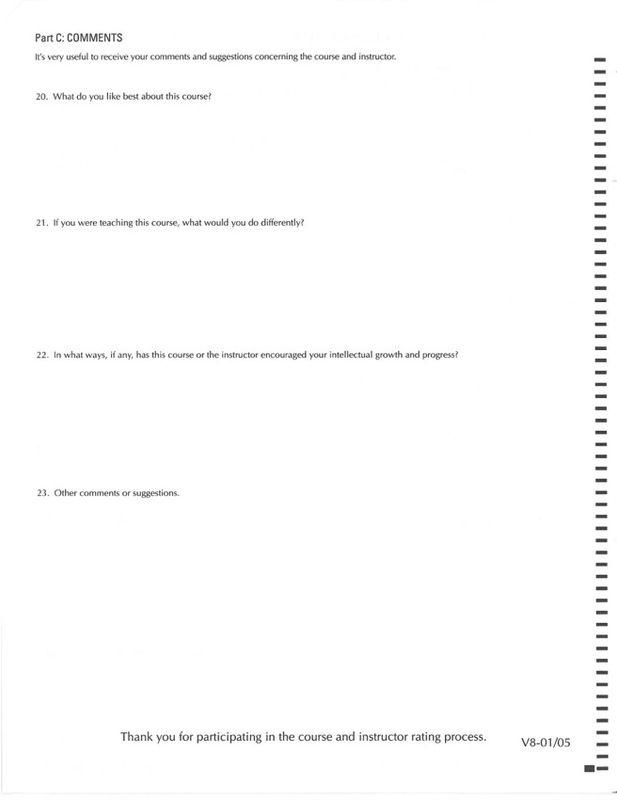 Please tell the students to note that the response fields for each question read from left to right, with the lowest scored response ( strongly disagree or poor ) to the far left and the highest scored response ( strongly agree or excellent ) to the far right. Please ask a student volunteer to monitor the class while the class completes the Student Instructional Rating Forms, and collect the completed forms. Ask this volunteer to return the completed survey forms and the header sheet in the original envelope to either the department's undergraduate office or to the Center for Teaching Advancement and Assessment Research at 116 College Avenue. The original envelope has a mailing label addressed to the CTAAR in place, so the student volunteer can simply seal the envelope and drop it into campus mail. Please leave the classroom before the students begin to complete the Student Instructional Rating Forms.